We've all had it happen; you finally full combo a song, rush to enter your scores on scorehero, and feel a sudden surge of disappointment when your score is 10,000 away from the top score (or more). This strategy guide is written to address that problem. Don't trust star paths posted online! Many people (including me) post star paths online. But usually they are not the true optimal path. They can also prejudice you in a certain way if you look at them before trying it yourself. I usually try to work out a path myself first, then I will look in the forums to see how my path compares with other people's paths, and I may possibly tweak my path if it appears that another path is better. Figure out the best path 'on paper' first. Most people attempt to find the best path by simple trial and error, but in 90% of the cases you can find the best path by simply looking at the chart and counting notes (although you may have to tweak it a bit once you actually play it). You will save a lot of time by spending 5 minutes with the chart, rather than playing through 20 different paths. In some songs, it is possible to activate star power before your score meter in all the way to 4x. Usually, it is best to avoid doing this (although it is required in some cases). Star power activation is calculated per measure, not per beat. So, if you have a full bar of star power, this is worth 8 measures, regardless of how long the measures are. In some songs (Trogdor, Tatooed Love Boys, Them Bones, etc.) knowing this is extremely important. Frequently, the optimal path on a given difficulty will be similar to the optimal path on other difficulties. However, in some cases the optimal path will be entirely different. Don't be prejudiced by the path on one difficulty when choosing a path for another difficulty. When figuring out the best path, there is no need to remember how many points each note is worth; simply count each single note as 1 point, and each chord as 2 (or 3) points. Also remember to count held notes, 1/2 point per beat (or 1 point per beat for 2 note chords, and 1 1/2 points per beat for 3 note chords). NOTE: The only time this won't work is for activation at the beginning of the song, before your score meter reaches 4x. Most people are aware that each star power (without held notes) gives you 2 measures of activation time. But what about adding in those held notes? Here's a important tip that saved me a ton of time once I figured it out: Each beat of a held note is (appoximately) equal to one extra beat of activation time. So, for example, if you have 3 star powers, and 3 beats of held notes, you have approximately 6 measures + 3 beats of activation time to use. Note that actually, you have a little bit MORE than that, since 7.5 beats of whammy = 8 beats of activation, but that will get you a good estimate. NOTE: This tip only works in 4/4 time!!! This is because in 4/4 time there are 8 beats in 2 measures; for other time signatures this tip will not work! In this section, I'll work through the process of creating a good SP path step by step, using an example chart (Parasite Expert). For reference, the Parasite note chart is here∞. 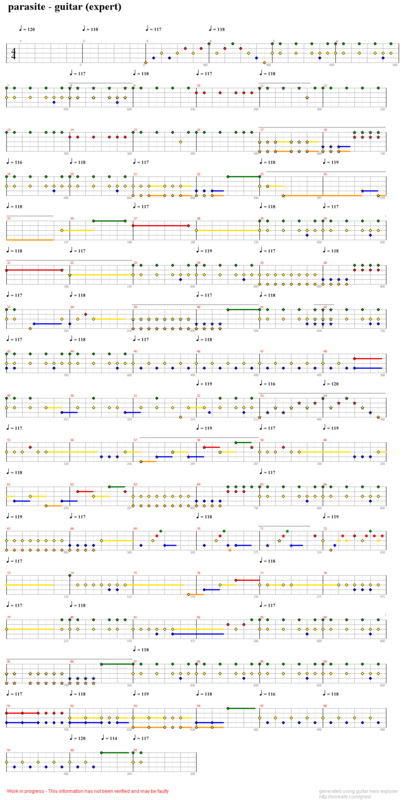 I find it helpful to print the chart out, so I can scribble on it and have easy access to it while I'm playing. I usually circle and number them to make sure I don't skip any. Step 3 - Figure out how many measures each star power is worth. This is an important step that many people would skip. Figure out how many measures (or fractional parts of a measure) each star power is worth. In the example, I have noted this number in parentheses. IMPORTANT: At this point, this number is just an estimate. For help in figuring out how to get this number, see the 'How to count SP durations' section above, or refer to the scoring FAQ. Here we have a bit of a puzzle. We definitely want to group SP's 1, 2, and 3 together, since we can get an activation on SP 4 all by itself, and barely have enough to time to use it before SP 5. So, we could skip SP 3 altogether, leaving us with 4 measures of activation. However, note that if we wait until AFTER the two whammy notes in SP 3, we have an additional 2 beats of activation time. An activation all by itself, and we have just enough time to use it before the next SP. We have exactly 4 measures to use here (since the whammy lasted for exactly 7.5 beats), so we should be able to pull off a squeeze for some extra points. We'll get the max points by activating right away, so that we get all the chords under SP. We'll want to activate 5 measures later, to get all the chords under SP. There are lots of notes right after this, and finding the exact placement for SP will be tricky. The best thing to do here is simply figure out how much SP we have (here it's 4 3/4 measures) and make a few guesses on paper, then add up the point totals to see which one works out the best. In this step, we'll play through the song and try out our star power path. Our approximations may have been off a bit, and we'll need to figure out exactly where notes can be squeezed. Note that we can complete the first 4 steps without playing the song at all! By the time we get to playing the actual song, we're just making some final adjustments to get things just right. This section is about activating star power at the correct time. This is extremely important to maximize your score. To activate star power, you may either tilt the guitar (the 'normal' way), or press the select button. I find that activation using the select button gives me a much better control over the exact timing, so I always use the select button to activate star power. However, many good players use tilt exclusively and can still get good results. I would suggest that everyone try both methods and use whichever method seems to work the best. Many people use the side of their palm to activate the select button. I, however, prefer to use my pinky. To practice, put your hand in its normal strumming position, then rotate your wrist to be slightly more vertical. Now stretch out your pinky until you can reach the select button. You should be able to keep both your thumb and first finger on the strum bar, and still reach the select button. This is important for activating in fast passages. I keep my hand in a normal strum position until right before an activation, then I begin to rotate my wrist so that I can have my pinky over the select button at the right time. It takes some practice, but it's not too hard once you get the hang of it. This question gets asked over and over on the forums; the simple answer is that squeezing is starting a star power activation slightly late, and playing the last note or two of your activation slightly early, so that they are included in your star power section, and thus get you more points. First, remember to activate the select button very, very slightly before the first note, but not at the exact same time. You should hit the select button, then immediately strum the note, in one fluid motion. And remember, do this slightly after the note. At the end of the activation, simply strum the last note slightly ahead of the beat. The timing window on GH is huge, so usually you can push this a lot more than you think. How do I know if I got the squeeze? It's sometimes hard to judge if you activated a squeeze correctly, especially at the end. Watch the last note carefully, and see if the color changes back to its normal color just before you strum. Another technique you can use is to pause your game (assuming there is a rest in the music! ), and write down your score, to see how it compares with other times through the same passage. Once you get good at squeezing, you can really push your squeeze to the very edge of the timing window. In some cases in fast passages, it is actually possible to squeeze in an extra note (or more) beyond what you could normally squeeze. there are no whammies, so each activation is an exact number of measures, and the tempo is slow which makes it easier. Mr. Fix-It - The first squeeze in this song is arguably the most straightforward squeeze in any song on expert. Start the first activation on the GY chord after getting a half bar, then hit the identical GY chord 4 measures later slightly early to get it under SP. Any song on Easy - I highly recommend trying this out on an Easy difficulty first, until you have the basic technique. Squeezing is much easier when you don't also have to worry about hitting all the notes. Learning to correctly use the whammy bar is essential for maximizing your score. When using the whammy bar, always use your fingertips only; don't take your thumb off the strum bar!! If you strum the note, then quickly move your whole hand down to whammy, inevitably you'll miss a bit of star power. If you are doing alternate strumming, you'll need both your thumb and first finger on the strum bar, so use your remaining fingers to whammy. How fast should I whammy? It has been discussed over and over on the forums, but I'll reiterate it here. It does not matter how fast you whammy; your star power meter goes up at the same rate regardless. I usually do a very slow whammy, since it's easier to keep your hand in position if you're not flailing about wildly. Whammying can get tricky when there are multiple held notes in a row; this is where hand placement is especially important, since you need to keep whammying and strumming at the same time. Here's a handy tip: you can stay 'in the blue' when whammying for a few moments after you stop whammying. So in sections with fast held star power notes, you can simply hit the whammy bar in the same rhythm with your strums. To get full points from your whammy, you need to strum the beginning just a bit ahead of the beat. You should strum the note slightly early, then immediately begin to whammy. It's pretty well known that using this technique will allow you to get a star power activation with only 7.5 beats of held notes. However, you should ALWAYS use this technique for your whammying to maximize the amount of notes you can get under SP. NOTE: In a few cases, the optimum path will require you to not whammy everything; in some cases you may need to whammy only part of a held note, or not at all. More Than A Feeling - The classic song for practicing whammying to get an activation with only 7.5 beats of hold. Hey You - Great for practicing whammying multiple held notes in a row. Mother - You can get an activation from the very first SP (even though that's not necessarily the best path!). It's a pretty hard one to get, though. It happens early in the song, so it's good to practice multiple times. If you've followed all the above techniques correctly, you can usually post a score that is within a few points of the highest score. But what about those last few points? Why does one person score 200,458 on a song, but another person might score 200,422, using the same path and activations? The answer is in hold points. You need to maximize the amount of points you are getting from each held note. To do this, remember this little secret: you will NOT lose hold points for hitting a note late. No matter how late you hit a note (assuming you hit it within the timing window), you'll get the full amount of hold points for it. However, you will lose points for releasing a note early (or strumming another note before the hold is completely finished.) What does this mean for your score maximizing strategy? 1. When you have several held notes in a row, don't strum them early. If you err, err on the side of hitting them slightly late. 2. When you activate star power on a held note, wait as long as possible to activate. You won't lose any points for doing this, and you might be able to add extra activation points at the end.